At the Y, we know it is our mission to help those in need. We are committed to building a stronger community through special fundraising events that allow us to strengthen resources and give back to those who need it the most in our local communities. This event will take place on Thursday, July 4th at the Crown Valley Community Park at the Laguna Niguel YMCA. This proud community tradition features a 5K run/walk, 10K run, dog walk, and children’s races with proceeds benefiting the Y’s scholarship program. Get ready to EXERCISE YOUR INDEPENDENCE! Sponsoring a YMCA event is an incredible opportunity for your group, company, or organization to make a significant impact in the community. Sponsorships start at just $500. Click here to view detailed sponsorship information. If you would like more information about being a sponsor, please contact Kelly Kneubuhl, RITP Staff Chair at kkneubuhl@ymcaoc.org. Money raised from the annual Crab Feast and Auction Under the Stars is used to support YMCA programming for under-served children and families in the community. One such example is our fully subsidized afterschool care program at the Richman Neighborhood Center in Fullerton. Register at the Fullerton Family YMCA front desk. Fill out the Registration Form and mail it to us. Call our facility at (714) 879-9622. *Every golfer will receive lunch, dinner, entry into all contests and players package. Want to Play Pebble Beach?! Get your raffle ticket now for a chance to win 2 entries to the Pebble Beach Lexus Champions for Charity Tournament! Sponsoring a YMCA event is an incredible opportunity for your group, company, or organization to make a significant impact in the community. Sponsorships range from just $250 up to $10,000. Can’t attend but want to support the event? The volunteer golf committee is seeking wine donations of bottles $25+ for the event. Please deliver to the Mission Viejo Family YMCA. Please contact Jennifer Heinen at jheinen@ymcaoc.org with sponsorship questions or to submit your completed registration form. 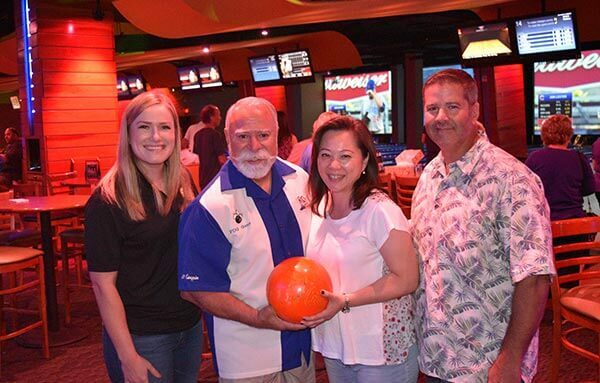 The 6th Annual Charity Bowling Tournament will be held in October 2018. Bring your team out for an evening of fun with friends, family, and supporters of the Yorba Linda – Placentia Family YMCA. Proceeds from this event help support the YMCA scholarship program so that everyone has the opportunity to benefit from YMCA programming regardless of economic status.